The Aura is really a stereo sound sampler that supports basic playback facilities which connects to the PCMCIA port. It contains an AD1847 16bit codec with an ADSP2104 DSP clocked at 20Mhz. It supports sampling and playback at 16bit resolution with a potentiometer for uprating the audio signal. 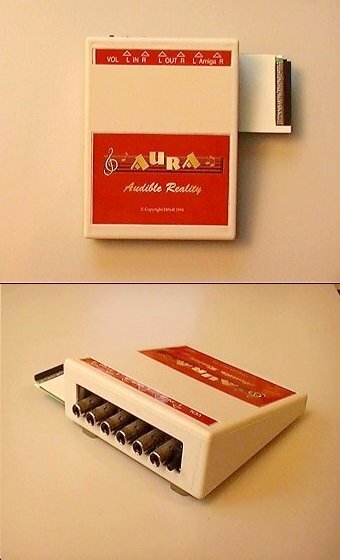 The Aura can also be configured as a MIDI-1 channel sampler. The software provides extensible effects regarding realtime processing of incoming sound when directed to an external device for recording or mixing purposes. Every effect has its sliders for extensive control. For sampling direct to hard-disk a fast machine (at least an 030) and a fast hard disk are recommended to achieve 48Khz real-time stereo sampling. 1 x Input for the Amiga's left and right audio outputs. Page contributors: Didier Sandra, Sebastian Horsch.